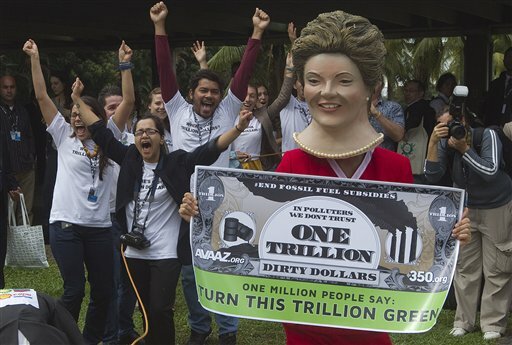 Environmental activists during a protest on the final day of Rio+20. The outcome of the United Nations Conference on Sustainable Development (Rio+20) was predictable. Almost all national leaders perfected the art of hiding their heads in the sand (or corporate contributions). Ironically, the cool conversation of Rio comes as the Earth’s average land surface temperature for May 2012 measured as the all-time warmest May on record (1.21°C (2.18°F) above average). While Rio+20 failed the planet, it was a big success for powerful nations and corporations. We saw no definitive action on the health of the oceans. Attention to rich consumption footprints was ignored. Financial commitments were minimum. We took no steps to establish timetables and indicators of environmental progress. In fact, Rio+20 even managed to eliminate the traditional support for access to reproductive health services. The U.S. helped to preclude language that would urge big business to respect human rights and led efforts to exclude ideas such as “sustainable consumption and production patterns.” The U.S. also worked to decouple economic growth from the voracious consumption of natural resources. The U.S. State Department, and Secretary Hillary Clinton, promoted the go slow approach of “pragmatism” to meet impending catastrophe. Business as usual was the mantra. The big winners at Rio were multinational corporations in general, and petroleum, coal and energy companies in particular. They bought the U.N. as they’ve already bought the U.S. government. A recent report, The Anti-Environment Record of the U.S. House of Representatives 112th Congress, reveals that the House voted 247 times in the last 18 months to reduce environmental protections. This makes it the most anti-environment House of Representatives in U.S. history. It enriched the oil and gas industry 109 times! Corporate capitalism has almost completely co-opted the environmental movement by insuring a message of more growth, not less. The greater the accumulation of capital (in the fewer hands the better), the “greener” the economy. The inhuman and unnatural consequences of this policy are deemed “externalities,” or secondary side effects – valuing symbolic individual action, and the consumption of “green products.” This focus on individual action is a key component in thwarting our ability to grasp the necessity for collective action. It’s hard to identify any global social movement that’s become more coopted than the environmental movement. There has also been a global campaign against science. Fifty years after maligning Rachael Carson and her iconic book Silent Spring, corporate power maintains its global effort to discredit science, i.e. climate change. In the U.S., such efforts are sustained by the extraordinary religiosity of the country. The alternative to the U.N. Conference was the “People’s Summit” and massive protest demonstrations of 80,000 people. However, like most such “Peoples” events, there was scant discussion of any serious alternative to existing systems of production, distribution and consumption. The most important outcome may be the effort of Friends of the Earth International (the world’s largest environmental organization) and partners, who led the opposition to the U.N. sellout, issuing the report, Ending Corporate Capture of the United Nations. Evidently, the political reality of national governments is often outstripped by the vision and practical action on the environment by cities. The existing political order of the world, reflected at Rio+20, is not capable of meeting the environmental catastrophe generated by global markets. Finally, what might be a successful road to Rio+40, for an equitable and ecologically viable alternative global system? : Waiting twenty years is too dangerous – Rio+30 is necessary.We need a new global grassroots movement that unites residents, workers and consumers, in rich and poor countries. This is essential for a world free from the violent control of corporate capital. Corporate hegemony over countries and cities must be made transparent and reversed. Existing export manufacturing patterns and current patterns of energy production and consumption, fishing, forestry and agriculture, require profound changes in conception and development. The U.N. itself must transform to minimize influence of corporations and increase the role of cities. It must support and enforce a genuine regulatory regime with authentic punishment capacity toward offending corporations. An increased role for cities means they begin to abandon their ambitions as Global Cities and build regional self-reliance with new forms of democratic governance. An expansion of the Right to the City must be accompanied by genuine Rights of the City within national and international forums, including fiscal control of local wealth. Development, including poverty and inequality reduction on many fronts (such as flows of food, water, energy, medicines, housing, essential consumer goods), must be consistent with insuring human needs, human rights and civil rights for all, including indigenous people and migrants without citizenship. To find a road to Rio+30 we must start looking now, for surely there is no existing roadmap. An extended version of this article is available here. Barry Weisberg, JD, PhD (ABD) is Global Cities Contributor for WBEZ and adjunct professor at Hong Kong University and the University of Illinois at Chicago.